005.Rebecca Young – JavaMuseum 2010 – Celebrate! Rebecca Young is an award-winning new media designer and academic. She has worked in film, television and new media since 1990, as a film editor, designer, illustrator, animator, researcher and educator. Her work as a broadcast designer for film and television includes information design, animation for title sequences and special effects. short work description (max 300 words, English): The bizarre and tragic deaths of Margaret Chandler and Gib Bogle on the banks of the Lane Cove River in Sydney, 1963, remain an elusive and intriguing Australian mystery. 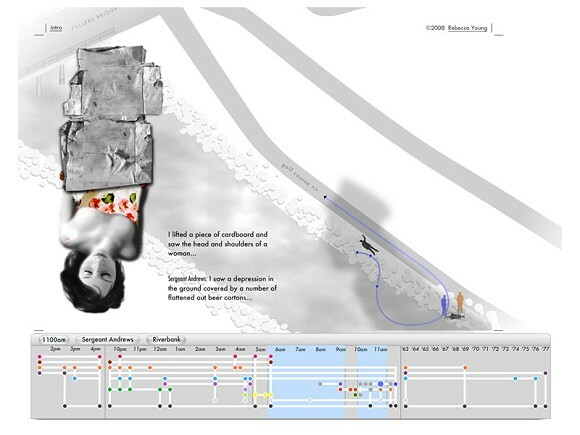 This website explores the theme of inconsistent and impermanent memory, allowing the viewer to shift forward and backward through time, space and point-of-view, and so compare eyewitness accounts of the deaths. 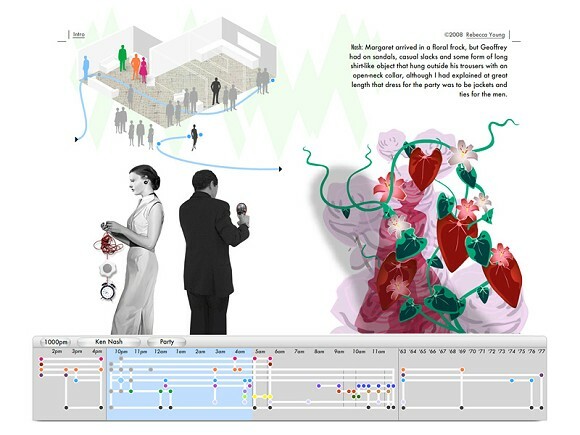 The story is represented by a dynamic montage of sound, image and text, and is controlled via a map/graph interface. As the viewer progress through it, the project becomes less about solving the crime and more about revealing the enigma of individual experience and interpretation. It is also about how a time and place, in this case Cold War Sydney, inescapably shapes the perceptions of the people who live within it, and how people who suffer an unexplainable tragedy are often blamed for it. It is the story of an improbable murder or an implausible accident; a puzzle without a solution where objective truth becomes impossible to grasp because it does not exist.